Bangalore/Mumbai/New Delhi, India (15th Jan, 2018) – The car that launched a brand, the Lexus LS, arrives in India. The highly anticipated fifth generation LS500h will soon be available in India, promising to elevate the luxury commute. The LS500h is the result of years of careful craftsmanship, to deliver for those who accept no compromises and have a global frame of reference for the exquisite. From design through to performance and comfort, the LS500h delivers a peerless drive experience. The original luxury disruptor, the Lexus LS has for nearly three decades set benchmarks for powertrain smoothness, ride quietness, craftsmanship, attention to detail, documented dependability and long-term quality. The LS500h takes the interpretation of Lexus unique L-finesse design language to an unprecedented level of elegance. The bold design of this vehicle means that the roominess of a traditional three-box design comes with all the appeal of a 4-door coupe, housing a six-light cabin. Peak performance begins with an all new ultra-rigid Global Architecture - Luxury (GA-L) platform, which provides the framework for precision handling. The only long wheel base model in the portfolio, the LS500h sports a new multi-link air suspension system. Lexus’ technological innovations are inspired by boundless imagination but anchored in a human-centric approach to functionality. This is realized in the LS500h, inspired by our Formula One technology and powered by a 3.5L V6 petrol engine combined with a 310.8kV Lithium ion battery, delivering 15.38 km/litre in a BS6 compliant vehicle. The world’s first multi stage hybrid system offers exhilarating performance and greater efficiency with perfect amalgamation of the electric motor and a simulated 10-speed automatic transmission that enables precise shifts. The LS has advanced electronic controls to bring Vehicle Dynamics Integrated Management (VDIM) to an even higher level. This new sophisticated VDIM system integrates and controls six different vehicle dynamic movements. Technological excellence has also been extended to the entertainment features of the LS500h. Time spent in traffic will no longer be lamented, thanks to the entertainment features of the vehicle, led by a 23-speaker Mark Levinson Quantum Logic Immersion (QLI) Reference Sound System, which delivers near live performance quality audio. “For those who have arrived in life, the Lexus LS500h has now arrived in India. We are so thrilled to be adding the LS500h to our line-up here. When we think of the exacting standards of the most discerning Indian car owners, we are confident the new LS will impress and delight – through its design, its performance, and the efficiency of the world’s first multi stage hybrid system,” said N Raja, Chairman, Lexus India. 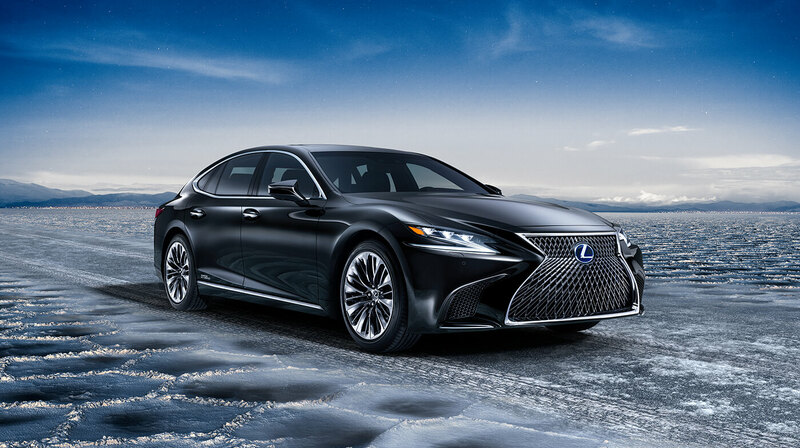 From the first impression, a striking view of the iconic spindle grille incorporating 5032 individual grid facets, the LS500h keeps elevating the standards of a luxury sedan. New levels of Takumi craftsmanship have been achieved in the LS500h – in interior stylings inspired by origami hand pleats and Kiriko cut glass. Working with a fabric artisan from Kyoto, Lexus designers created a special pleat design which changes its expression when lit by daytime sunlight or the vehicle’s interior lighting. The quest for luxury leading craftsmanship doesn’t stop with the exterior shape of the vehicle. Glass has rarely been used as an interior door-trim piece but the Kiriko-cut glass gives the LS instant distinctiveness and a level of artistry never seen before in an automobile. Aesthetics extend to omotenashi concepts which have guided the comfort features in the LS500h. Class-leading luxury of 1022mm of legroom is complemented by the comforts of Shiatsu massage technology, heating functions and ottomans in the rear for added comfort. Exceptional interior quietness provide a shield from the busy roads. The vast range of adjustments offered by the front seat of the LS gives everyone a reason to rejoice about a relaxing drive no matter how they are built. Lexus is crafting some of the best, most supporting seats in the industry with the understanding of how that surface which cradles a driver makes them feel and react about the drive. “This is a car crafted for someone who has known the pleasures of dining at Michelin-starred restaurants, holidaying at the best resorts and generally being at the top of their game. The LS500h delivers beyond passion in ways that are wholly uncompromising so that the daily commute is transformed to an experience of epically luxurious proportions,” said PB Venugopal, President, Lexus India. The Lexus LS500h will be available for booking from 15 January 2018 Ex-showroom at INR 1,77,21,000 for the Luxury Grade, INR 1,82,21,000 for the Ultra Luxury Grade and INR 1,93,71,000 for the Distinct Grade.